Jacksonville Beach is bike friendly! How did I miss this?! Last August, the Huffington Post put out an article that listed Jacksonville Beach as one of the most bike-friendly beaches in all of Florida. The article cites the numerous bike racks near the beach and surrounding businesses. Other beaches on the list include Daytona Beach, Miami’s South Beach, Sanibel Island, Cedar Key, Key West and St. Joseph Peninsula. Biking is becoming more and more popular all over the country. When people go on vacation, they want to rent bikes. The increase in bike sharing programs is evidence of this. I think we owe it to our community to make sure that people who visit Jacksonville from out of town know that they can enjoy biking on our beautiful beach. Start by linking that HuffPo piece to your social networks — surely a few of your Facebook friends and Twitter followers are from other cities? Make sure they see that piece. Secondly, you can hop on your own bike and cruise the beach. Take pictures. Show people just how bike friendly Jacksonville beach is. Lastly, when out-of-town friends come to visit, suggest taking your bikes to the beach. 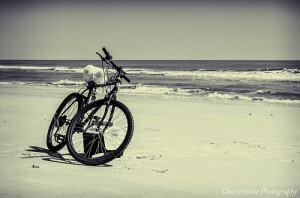 When your friends go home, they will tell their friends about the great time they had biking on Jacksonville beach. You really can’t beat word-of-mouth when it comes to spreading awareness. A bike friendly beach is great, but how does the rest of the city rate? Increasing a city’s friendliness towards bikes and cyclists can take a lot of work, time and patience. But when you can ride safely down any street, and get anywhere you need to go on a bike, isn’t it worth it? I do think that promoting Jacksonville Beach as a bike-friendly destination is a good start. When more cyclists start choosing Jacksonville Beach, others will see the benefit of promoting bike infrastructure, and (I hope) bike infrastructure will improve throughout the area.